Frequently a motorcycle duffle bag is exactly what you need to hold and protect your gear for a short ride or even a long trip. You may only need a fraction of the room your saddlebags provide. On the other hand, you may need a convenient way to add to your motorcycle's gear-carrying capacity. In either instance, the right-sized motorcycle duffle bag should fit the bill. The best bag I've found that protects my gear, keeps it dry and is easy to pack and handle is the Wolfman Expedition dry duffle bag. Sure, you can go to any sporting goods store and find some sort of duffle bag or gym bag to attach to your bike. But this Wolfman bag, which comes in three sizes, is really tough and thoroughly waterproof. It will keep your stuff dry and can withstand the expected and unexpected abuse motorcycle riding delivers. The bag's main body is made of thick 22-oz vinyl while each end is an even thicker 34-oz vinyl. This material and the bag's construction do a nice job of resisting rips, cuts and abrasions. Waterproof webbing attached to the top opening and waterproof seams prevent moisture from wicking in. Each side of the wide, lengthwise top opening is reinforced with a stiffening bar running from end to end. You spread the sides of the opening to pack or remove your gear. After bringing the sides together to close the top, you roll it down three or four times. Then tighten everything using the bag's four integral compression straps -- two over the body and one on each end. Two mounting straps are included with these Wolfman bags to help you secure them to your motorcycle. A padded, removable shoulder strap and comfortable handles make this bag easy to carry when it's not secured behind you on your motorcycle's seat or luggage rack. 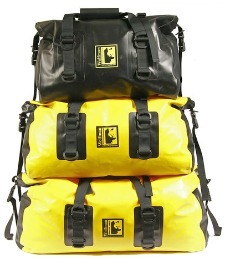 The Wolfman duffle bags come in two colors -- yellow and black -- and three sizes. The Small size bag suits most of my gear-carrying needs. It fits just right on the passenger portion of my motorcycle's seat. I use it by itself for short trips or with my saddlebags and other motorcycle luggage when I want to increase my gear-carrying capacity. I use a Medium size bag when I intend to ride to one destination on my motorcycle then remove most of my travel gear and carry it elsewhere. The size Large duffle bag -- to be honest -- is really big and heavy when completely filled. I hardly ever strap it to my motorcycle. But it gives me rugged service when I need a durable piece of luggage for other purposes. 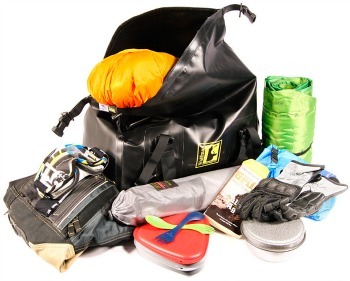 Check out the Wolfman Expedition duffle bag selection. The bags' reliable roll-top design makes it easy for you to pack and get to your gear. And when you're riding all day in wind-blown rain, you can take comfort in knowing you'll have dry clothes at the end of your trip. I'm always looking for reliable resources where you can get the motorcycle gear you need. 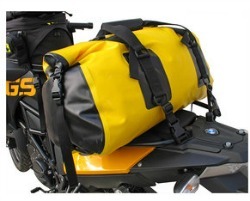 Click here to check out the Wolfman Expedition dry motorcycle duffle bags.